a. President Kennedy was already reacting to a gunshot, prior to Connally being wounded at Zapruder frame 224.
b. Ce399 (the magic bullet), was not the bullet discovered on the stretcher at Parkland hospital. c. The back wound to President Kennedy was anatomically lower than the throat wound, and President Kennedy was sitting upright in his seat at frames 224/225. d. Most importantly, the back wound was probed – but it did not connect to the throat wound! Let’s now look into other important factors which also destroy the single bullet fantasy, and prove that there was indeed a conspiracy to murder President Kennedy. I also discuss what I believe caused the back wound. In order for the single bullet theory to be true, the bullet which entered President Kennedy’s back had to exit his throat without striking his spinal column or ribs. 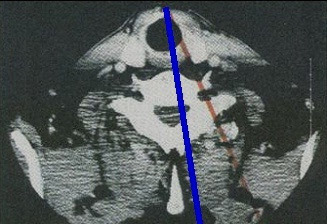 However, as Dr John Nichols demonstrated during the trial of Clay Shaw, and as Dr David W Mantik has proven much more recently, it would be impossible for the bullet to exit Kennedy’s throat without first striking his cervical vertebrae! To demonstrate this, Mantik took several X- rays of patients with similar chest dimensions as Kennedy. He then plotted the trajectory of the bullet which was depicted by the Rydberg drawing (Ce386). Now obviously, the nose of any bullet striking the cervical vertebrae at high velocity would become markedly deformed. However, we are supposed to believe that after allegedly having done so, the nose of Ce399 remained perfectly round. Completely absurd! Let’s also keep in mind that had the bullet become deformed, it would have left a much larger wound in the throat than observed by the Parkland Doctors. Further evidence that no bullet struck President Kennedy’s spine, comes from the Zapruder film itself. At frame 224 (the alleged frame of impact of Ce399 on both Kennedy and Connally), there is no forward movement of Kennedy, as there should have been due to the transfer of momentum from the bullet to his spine. Researchers agree almost unanimously that the horizontal trajectory of a bullet fired from the 6th floor sniper’s nest to the limousine at circa frame 224, was approximately 9 degrees right to left. This was the measurement which Dale Myers’ used to “prove” the single bullet theory, in his deceptive computer simulation. Using this measurement, I plotted a 9 degree right to left trajectory on Dr Mantik’s chest X-ray diagram. My trajectory is shown in blue, and Mantik’s in light red (with contrast and brightness slightly adjusted). As the above diagram clearly demonstrates, it would have been impossible for Ce399 to enter the President’s back and exit his throat, without first striking the spine. Also keep in mind that according to the Sibert/O’Neill report, the back wound was approximately 2 inches (5.1 cm) to the right of the middle line of the spinal column. Lone gunman theorists would have us believe that the bullet exited President Kennedy’s throat by magically avoiding hitting the spine, then went on to hit Governor Connally. We are also told to believe the wound to President Kennedy’s throat, and the in-shoot near Connally’s armpit, were in alignment for the single bullet theory to work. The truth is that nobody (lone gunman theorist or conspiracy theorist) can know for sure if they were aligned. Kooks like Dale Myer’s and David Von Pein, can rave and rant as much they want, but if Kennedy and/or Connally were off the required alignment, the single bullet theory fails. It’s one of those factors which (unlike the factors cited previously) is unknown. And that’s a fact. In defence of the single bullet theory, lone gunman advocates claim the bullet which hit Governor Connally was tumbling. 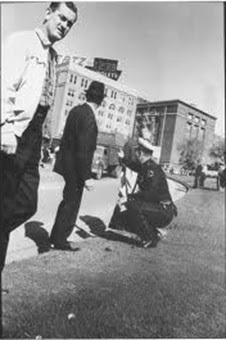 The implications of this being the bullet had first struck another object (President Kennedy) prior to hitting Connally. As “proof” they cite the length of the wound in Connally’s back which was 3 centimetres long (the same length as Mannlicher Carcano bullets). However, this is a gross deception on the part of lone gunman advocates. You see, whilst the wound was 3 cm long, it only became that long after surgical enlargement. In fact, the actually size of the wound was 1.5 by 0.8 cm. Milicent Cranor wrote a brilliant essay on this topic (here) where she completely destroyed this false claim. As Ms Cranor notes, Connally’s thoracic surgeon, Dr Robert Shaw, indicated on at least four occasions that Connally’s wound was only 1.5 cm long. The size of the bullet hole in Connally’s Jacket and shirt also measured 1.5 cm. Is this just some bizarre coincidence? As to the wound on the back of Governor Connally, was there any indication that the bullet was tumbling prior to the time it struck him? I would only have to say that I'm not a ballistics expert, but the wound on his chest was not a single puncture wound, it was long enough so that there might have been some tumbling. You mean the wound on his back? The wound on his back – yes, it was long enough so that there might have been some tumbling. In other words, it was not a spherical puncture wound. In other words, the elliptical shape of the wound could simply have been due to the bullet entering at an angle. The fact that lone gunman zealots try to hide this bit of information, is yet another example of their dishonesty and disregard for the truth. What I find to be very coincidental is that the 1.5 cm dimension of Connally’s wound is identical to the long dimension of the bullet hole near President Kennedy’s EOP! Furthermore, the shape of the two wounds is also similar. This tells me the two wounds were created by bullets from the same rifle. I hope to research this further in the future. The bottom line however, is that the evidence for a tumbling bullet is false. In previous posts on this blog, I expressed my belief that the bullet which entered near the President’s EOP, deflected downwards and exited his throat. I hope that you too will be convinced that this was almost certainly the cause of the throat wound. But first, let me give full credit to researcher Pat Speer for bringing this important discovery to my attention. Speer spent a considerable amount of time on his brilliant website, explaining that the head and throat wounds were connected. I hope that any serious assassination researcher will take the time to read through Speer’s extraordinary work. The majority of conspiracy theorists believe the throat wound was one of entrance. This is based on the observations of the Parkland doctors and nurses whom described the wound as being a “small neat wound”. Dr Malcolm Perry (who had performed a tracheostomy on the mortally wounded President) described the wound as being 3 to 5 mm in diameter, which the ballistics tests by army wound ballistics expert, Joseph Dolce, demonstrated was too small to be created by the 6.5mm Mannlicher Carcano rifle ammo. Naturally the conspiracy theorists who insist the throat wound was one of entrance, will have a difficult time accepting that it was in fact one of exit. But just consider this: When the tracheostomy was performed on the President, and oxygen subsequently administered, the doctors observed air bubbles forming out of the head wound! This is a crucial observation, as there is no anatomical explanation for air bubbles to form in the head wound. The only plausible explanation is that a wound track existed between the head and throat. The wound track was either created by the bullet which entered near the EOP, and then deflected downwards and exited the throat, or it was created by a fragment of bone from the base of the skull which traversed the neck and exited the throat. Quite ironically, this information is contained in non-other than Dr Humes’ autopsy report. The relevant excerpt from the report is below. “Shortly following the wounding of the two men the car was driven to Parkland Hospital in Dallas. In the emergency room of that hospital the President was attended by Dr. Malcolm Perry. Telephone communication with Dr. Perry on November 23, 1963 develops the following information relative to the observations made by Dr. Perry and procedures performed there prior to death. "Each time he squeezed on his air bag, bubbles of blood came out the brain wound." These observations clearly indicate that the throat wound was connected to the head wound – and not the back wound as per lone gunman zealots. This of course is absolute proof that the single bullet theory is totally fiction! It also explains what happened to the bullet which entered near the President’s EOP. Keep in mind that immediately after President Kennedy was pronounced dead, the Parkland Doctors expressed their belief that the throat wound was connected to the head wound. Following Zapruder frame 224, we see Kennedy reach for his throat with both hands, but he appears unable to co-ordinate his hand and arm movements. This is consistent with point 1. We can also see that his hand and arm movements are rather slow. This is consistent with point 3. We can also see that he slumps forward towards the floor of the limousine, and also slumps towards his left. This is consistent with points 6 and 7. Several of the parkland doctors wrote in their reports that President Kennedy’s eyes were deviated when they saw him. This suggests his eye movements were abnormal, as per point 9. For further reading on this issue, I refer you to Pat Speer’s chapter (here) on his website. There is very little doubt in my mind that the bullet which struck near the EOP traversed the neck and exited the throat. The only issue I have is whether the bullet would have been tumbling as it entered his skull. A tumbling bullet would have created an elongated throat wound, instead of the “small neat wound” the Parkland doctors observed. The big question concerning President Kennedy’s back wound, is whether it was created by a bullet, or by a fragment from a bullet which struck the road pavement to the right rear of the limousine. In my opinion, the evidence supports the latter. Let’s start with this: The back wound did not connect to the throat wound. A favourite tactic by lone gunman kooks is claiming that since no bullet was ever discovered falling out of President Kennedy’s back at either Parkland Hospital or at the autopsy, then the bullet must have exited his throat. Well no, not necessarily. If for example, Ce399 was fired from a cartridge with a faulty charge, then it could have been fired with insufficient muzzle velocity to penetrate through President Kennedy’s body. However, this theory was rejected by researchers such as Howard Roffman in his book, Presumed guilty. Also, if a bullet had hit the back at high velocity, and came to stop after penetrating just a couple of inches of flesh, then there would have been a noticeable forward jerk by the President. Only such a reaction is nowhere to be seen in the extant Zapruder film prior to frame 224. A small bullet fragment on the other hand, would not have produced a noticeable forward jerk by the President as he was hit. There are conspiracy theorists, such as Pat Speer, who believe Ce399 created the back wound, and fell out inside the limousine. However, I must respectfully disagree. If we are to contemplate such a notion, we have to believe the hole in President Kennedy’s shirt was still perfectly aligned with the back wound – after his right arm had dropped following the kill shot(s). In the Zapruder film, we can see that Kennedy’s right arm is resting on the top of the door, with his right shoulder elevated above his left shoulder. Hence, the shirt fabric on the right side of his body was also slightly elevated. Since the evidence indicates the first non- silenced shot was fired between frames 178 and 190 of the Zapruder film (please see previous posts), and if the back wound was inflicted at this point, then after his arms dropped following the kill shot(s), the hole in the shirt would have been lying inferior to the back wound. Please see this post for evidence that President Kennedy was reacting to a gunshot wound prior to Zapruder frame 224. Now this is quite problematic, for how the heck does a 6.5 mm Mannlicher Carcano bullet (actual diameter 6.8 mm) create a 7 by 4mm oval shaped wound? It can’t, for the simple reason that bullets create holes which are bigger than their own diameter. After all, it’s just common sense. However, a small bullet fragment could create such a wound. Although it is ridiculous that a bullet could enter the President’s back at a 45 to 60 degree downward angle, it’s quite possible that Humes had actually discovered the bullet entered at a 45 to 60 degree upward angle. Realising that it would be impossible to explain how a bullet could enter at an upward angle, Humes then lied by claiming it entered at a down-ward angle. Think about it, if a bullet fragment had deflected from the road pavement just to the right rear of the limousine towards the President’s back, it would have been travelling at a steep upwards angle. I realise that a fragment wound is just a theory, but this would explain why there was no exit for the back wound, it would also explain why no bullet was recovered at either Parkland hospital or at the autopsy, it would also explain why there was no forward jerk by the President prior to Zapruder frame 224, and it would also explain the upwards abrasion collar. It is also a viable explanation for the small 4 mm dimension of the back wound. Some time ago, I came across a photo on the internet which showed what appeared to be a bullet mark on Elm Street. Unfortunately, I have been unable to relocate it. If I find it again, I will upload it to this post. Let’s also take into account that several researchers discovered what appears to be a “bullet” hole(s) in the Stemmons freeway sign. For example, check out this video on YouTube. If the holes are legitimate, it would certainly explain why the sign was removed shortly after the assassination. A possible explanation for the holes would be bullet fragments which deflected off the street - following the impact of a bullet. So just what kind of bullet impacted the street? In my opinion, it was by all likelihood a Mannlicher Carcano bullet. Bear in mind that the FBI’s spectrographic tests determined there were traces of Copper inside the hole at the back of Kennedy’s suit jacket – but curiously none at the front slits of the shirt, where the bullet allegedly exited! The MC bullets of course were Copper jacketed. Therefore, the fragment was a piece of the copper Jacket of the bullet. Now it’s not as if this theory isn’t without problems. For example, the bullet could easily have hit motorcycle officer James Chaney, who was riding just to the right rear of the limousine. There are also the witnesses, such as Mrs Donald Baker, who saw a bullet strike the manhole cover on the opposite side of Elm Street. I don’t doubt that a shot had struck there, but in my opinion it was from the same rifle using a silencer/suppressor that fired the shots which hit the President near his EOP and Governor Connally. Below is the photograph of the manhole cover with Dallas deputy sheriff Buddy Walthers (wearing the hat) and DPD officer Joe W. Foster in uniform. Now, no bullet fragment from the back wound was ever reported to be discovered at either Parkland hospital or at the autopsy, but could it have easily been overlooked? I believe it could. Think about it, whilst it would be virtually impossible to miss seeing an entire bullet, nobody would really be paying attention to a small fragment. The fragment most likely would have fallen out of the back during cardiac massage, as the doctors were trying to revive the President. Let me further add, that if the back wound did not occur between Zapruder frames 178 and 190 from a bullet fragment, then the most logical alternative (in my opinion) is that it occurred at circa Zapruder frame 233 from a bullet impact, as the President jerks forward. Semi-automatic gunfire from a rifle could easily have inflicted the wounds to Connally’s back, Kennedy’s skull, and Kennedy’s back. However, given the small size of the back wound and the high velocity of rifle bullets, it’s unlikely. 4. Pat Speer’s ear witness analysis, which proves conclusively that the shot to Connally was from a rifle equipped with a silencer/suppressor. Although points 3, 4 and 5 don’t actually prove the single bullet theory is false, they do prove Ce399 was never fired in Dealey Plaza. I could have gone on. For example, I could have discussed the fact Ce399 lost more lead than was possible, or the lack of any clothing fibres from President Kennedy’s shirt/jacket in Connally’s wounds. Or that no fibres appear to be missing from the slits in the front of President Kennedy’s shirt where the bullet allegedly exited. However, these factors are small fry compared to what I listed above. Despite the impossibility of the single bullet theory, it amazes me how lone gunman theorists, such as Larry Sturdivan and Ken Rahn, continue to use the now thoroughly discredited Neutron Activation Analysis as “proof” of the single bullet theory. Seriously, the intellectual dishonesty of these people never ceases to amaze me.